Boatability can offer you a wide range of water based activities for individuals, families, or even groups of up to over 200. Ideally located within the Solent area, we have ready access to a variety of sea locations, including a number of historic sites! Whether it's a corporate outing by boat, a hen or stag do, a bit of boat / marine photography, or a sunset cruise in the Solent we will endeavour to meet your requirements. All our maritime packages utilise boats of exceptional capability, all of which are coded to Maritime and Coastguard Agency (MCA) specifications. 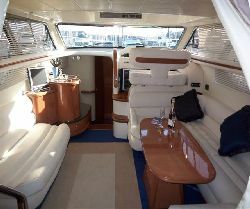 In addition, all boats are helmed by highly experienced and knowledgeable Skippers. This combination ensures both your safety and enjoyment during a thrill-packed day on the water.